These are either one-bedroom cabins or spacious one-room cabins, all with plush pillow top queen beds, quality bed linens and large bathrooms. 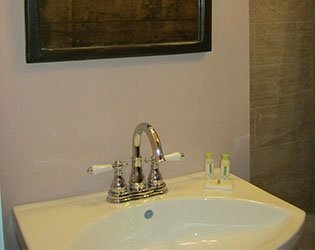 The bathrooms feature claw foot tub/shower combinations or oversize tile showers. 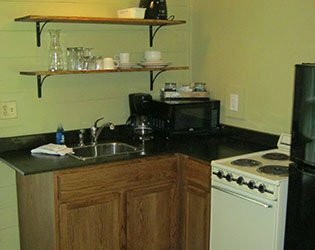 All of our standard cabins offer full kitchens stocked with plates, cutlery, glassware and pots and pans. The kitchens all include a microwave, toaster and coffee pot. Each cabin offers table and chairs for an eating area. Several of our standard cabins have cable TV, All of our cabins have heat, A/C and WiFi. 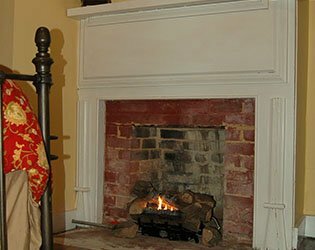 Several have fireplaces with gas logs. All of them have comfortable furniture in the living room areas as well as seating on the front porches so you can enjoy the sound of the creek running through our property. We do have a number of "dog friendly" cabins.Cabin rates are $95 to $120 nightly, please see our Check Availability page for pictures and individual cabin details.